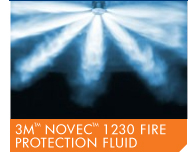 Novec 1230 Fluid is the next generation in fire suppression technology and is the first halon replacement to offer a viable, long-term, sustainable technology for special hazards fire suppression. It has excellent environmental credentials with zero ozone depletion potential (ODP), a global warming potential (GWP) of just one, and an atmospheric lifetime of only five days. Novec 1230 is stored as a fluid and discharged as a gas and offers a safety margin of up to 100% - which is higher than any other clean agent. It reaches its extinguishing concentration in ten seconds or less, and does not leave any residue behind thus causing no damage to the systems and equipment it is protecting. It is a highly efficient fire extinguishant that can be used for both streaming and flooding applications and is ideal for special hazards such as spaces where the criticality of maintaining operation of high-value equipment is paramount, such as in computer suites, telecommunication rooms and control centres. Argonite is an inert gas blend of argon and nitrogen, both of which occur naturally in the environment. With zero ozone depletion potential (ODP), zero global warming potential (GWP) and no atmospheric lifetime, it has excellent environmental properties. 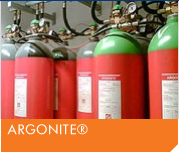 Argonite extinguishes fires based on the principle of oxygen depletion and when released into an enclosed space, an atmosphere is established in which the oxygen concentration is decreased from a normal 21% to 12-13% by volume. At this concentration, fires will be effectively extinguished. Argonite is suitable for use in areas such as computer suites, telecommunications rooms, Archive stores, Control centres, Switchgear rooms, Laboratories and Art galleries. In response to the phasing-out of Halon fire extinguishants, FM200 was widely used as a replacement for applications requiring a clean, environmentally acceptable fire extinguishing agent, suitable for use in manned areas and has been cleared for use in occupied areas at the normal design concentration. It has a zero ozone depletion potential (ODP) with a global warming potential (GWP) and atmospheric lifetime of about 31 to 42 years. This lifetime has been considered as acceptable for fire extinguishing compounds by the US Environmental Protection Agency's Significant New Applications Programme (SNAP). FM 200 works on the principle that in order for a fire to be sustained, the three components of the fire triangle (fuel, oxygen and heat), must be present in sufficient quantities, and at sufficient levels and if one of these three elements is removed the fire will be suppressed. 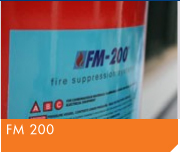 FM200 is a physically-acting extinguishing agent which acts by absorbing heat and disturbing the dynamic energy balance. By Introduction of sufficient FM200 into the fire the gas reduces the flame temperature to a value below which flame propagation can occur and is suitable and safe for use in most enclosed occupied areas. Whilst other inert gases, such as nitrogen, argon and carbon dioxide can be used, they are very poor heat absorbers and high concentrations are needed in order to suppress fires. Consequently the oxygen concentration in the atmosphere of the area becomes severely depleted to typically around 12% and where oxygen level’s are below 16% it is considered a potential health hazard and can cause asphyxiation. In addition Carbon dioxide is also toxic at concentrations of around 8%. 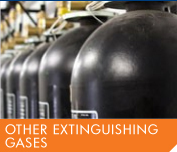 As a result these extinguishants are not as widely used in new installations as the other systems mentioned.